Calculate any Texas Hold'em poker odds instantly! New! Dealing noises + vibration added. New! No internet connection required. All calculations are now done on the device. 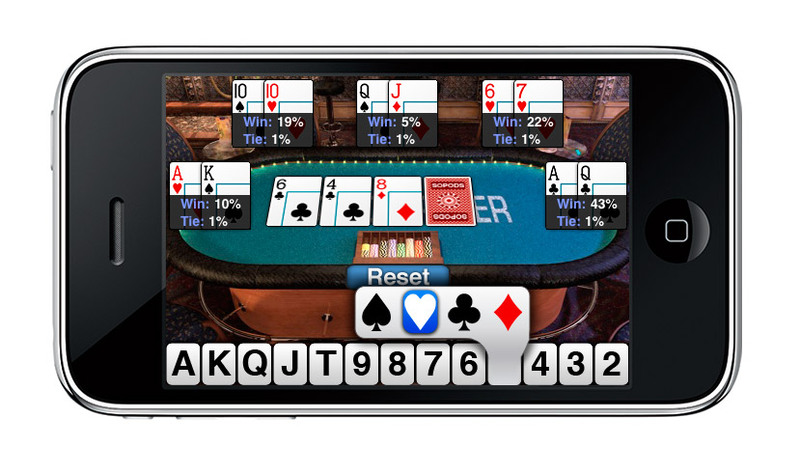 Poker Odds was designed from scratch just for the iPhone & iPod touch. This is not your average odds calculator. Don't you hate it when you keep playing a poker hand back and forth in your head trying to figure out the correct move? Trying to figure out who had the best hand? Who should go all-in, who should fold? Now that you are armed with Poker Odds in your pocket you'll never have to worry again. Get realtime odds anytime, anywhere. Simply select the number of players, then use our exclusive "Card Keypad" to select and deal out cards... iPhone Style. Odds are automatically calculated at all critical points in a Texas Hold'em poker game: Once all hole cards are dealt, after the flop, after 4th street, and finally after 5th street. The interface is made up of a 5 handed Texas Hold'em poker table with our exclusive "Card Keypad" along the bottom of the screen. 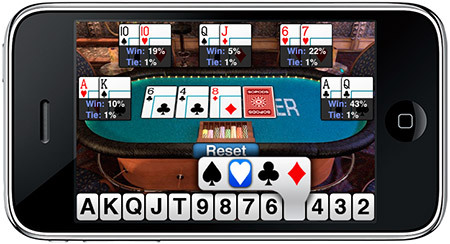 When in vertical mode Poker Odds will display the startup screen as well as access to the help section. Poker Odds uses advanced monte-carlo simulation based odds calculation for Texas Hold'em Poker. It was designed from scratch to give iPhone & iPod Touch users the very best experience possible. Using Poker Odds you can calculate real time poker percentages in any Texas Hold'em game with anywhere from 2 - 5 players.